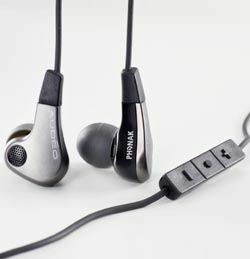 Phonak launches £400 PFE 232 in-ear headphones | What Hi-Fi? Phonak has expanded its Audéo Perfect Fit range of earphones with the release of the PFE 232 headphones. The new earphones are set to retail at around £400 and, unsurprisingly, look to marry sound quality and a comfortable fit. Sporting two high-powered dual-balanced armature drivers in each earpiece, the earphones come with three sets of ear tips in silicone and foam. Weighing just 16g, the earphones come with a detachable cable, complete with in-line mic and volume controls. The control offers "100% compatibility with all Apple products", allowing you to answer calls, record voices and adjust the volume on the move. Also in the box is a carry case and a "cleaning tool". The Phonak Audéo PFE 232 headphones are set for release in early September and we hope to bring you a review just as soon as we get them.